This year, our usual family X'mas celebration was arranged on Boxing Day, 26 Dec. My elder sister hosted our celebration party at her place. 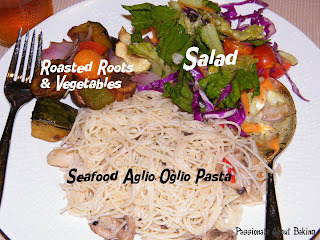 She single-handedly prepared three dishes for us - Salad, Roasted roots and vegetables and Seafood Aglio Oglio. It was really nice. My youngest sister prepared her usual fruit salad, a pre-dinner food. My third sister bought drinks. Each of us did our part to bring some food, to lighten the load from my sister. At times like this, I really appreciate my family being slightly bigger, where sisters come together to share burden and make merry! As for me, I made a Christmas Logcake. Wasn't a difficult task for me too! 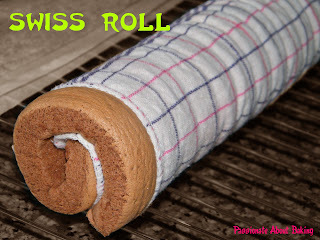 I tried a new swiss roll recipe from Daily Delicious. The cake sheet was pretty easy to make. I filled the cake sheet with whipping cream, chocolate ganache, hazelnut ganache and almond nibs. Rolled it up and poured chocolate ganache over it. As I was left with some whipped cream, I just splashed some on the cake to make it look more attractive. Decorated with Christmas decorations, and WO-LA, my Yule Logcake! Recipe for Chocolate Cake sheet, modified from Daily Delicious. 2. Line the base of 11"x13" cake tray with baking paper. 3. Using hand mixer, beat the egg white with sugar (add the sugar gradually) until stiff peaks form. 4. Pour the egg yolks into the egg white, beat with low speed for 1 minute. 5. Sift the flour and cocoa powder into the bowl and fold to combine. 6. Pour the melted butter into the bowl, and fold lightly to combine, then pour the batter into the prepared pan. 7. Bake for 10-11 minutes, or when a skewer inserted comes out clean. 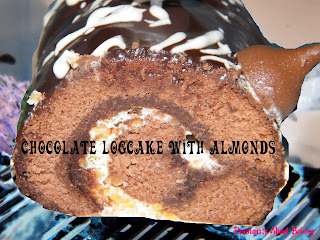 wow your choco log cake looks so yummy! Thanks! Happy holidays and a happy new year too! 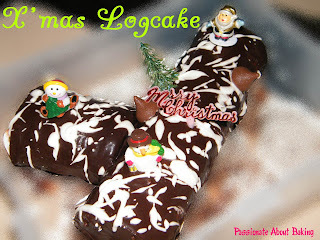 Ur log cake looks very delicious and pretty! 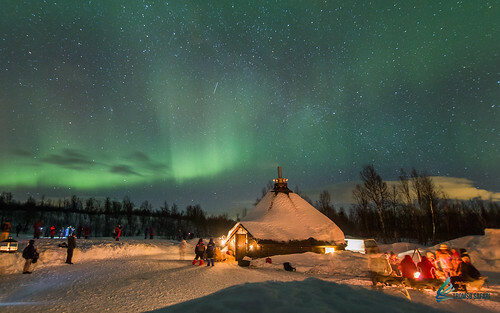 Wishing you a happy 2010!